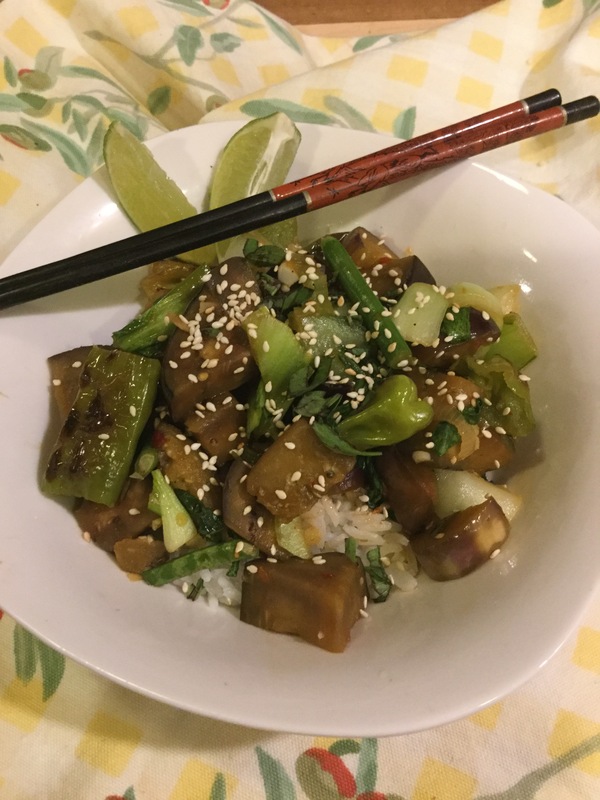 It has just been too hot to cook so I haven’t posted many recipes this summer but my garden is bursting with beautiful vegetables needing to be eaten so I cranked up the fans and air conditioner and made a delicious meal with eggplant, shishito peppers, long beans and bok choy. It was so worth the sweat! This Asian-inspired dish can be as spicy or mild as you prefer. Shishito peppers are Japanese cousins to the Spanish Pedron peppers that are very popular in California. Both varieties have a not too spicy bite that is enhanced by roasting them. They are quite delicious all by themselves hot off the grill with a good sprinkling of coarse salt. I wanted to add them to my sauté to give it a smoky heat. Asian long beans are so fun to grow, especially if you have children. We grow them in our school garden and the children will wear them around their necks for fun! Yes, they are that long. You use them just like regular green beans so if you can’t find them just substitute any fresh snap bean variety. This year I am growing several varieties of eggplant, including a white one which isn’t quite ready to harvest. I used both a big round purple eggplant and a Japanese narrow one, but any fresh eggplant will work. The bok choy came from a friend who grows delicious Asian greens. It adds a fresh, sweet flavor that balances the spicy peppers and seasonings in this recipe. Serve this over Jasmine or Basmati rice seasoned with lime juice. It is also vegan, vegetarian and gluten free, so super healthy with all the fresh vegetables. I’m definitely making this again, no matter how hot it gets! Peel and chop the ginger and garlic cloves. Set aside. Cut lime into wedges and squeeze juice of half them into small bowl. Save the other wedges for garnish. Cut eggplant into 2 inch pieces, place in a bowl and sprinkle with salt. Set aside. Cut beans into 4 inch pieces and the slice the bok choy stems into 1 inch pieces and roughly cut up the green tops. Chop the basil, green onions and/or cilantro for the garnish. Put 1 cup rice and 2 cups water in pan with lid, turn up heat and when it starts to boil, turn heat way down put on the lid and let cook for about 14 minutes until all water is absorbed. Set a timer so you don’t forget about it!! Heat a large wide saute pan over high heat (NO OIL) and add the peppers when it get hot. Let them start to blister on one side before you turn them over (about 3 – 5 minutes). Continue roasting and turning them for another few minutes until they begin to soften. Remove from pan, place on a plate and sprinkle with a bit of salt. When they have cooled cut off the stems and cut each on in half. Do not worry about removing seeds. Heat 1 TBSP sesame oil in the large wok style or wide saute pan you used for the peppers. Add chopped ginger and garlic and saute for about 1 -2 minutes then add eggplant (you can wipe of some of the salt first with a paper towel). Saute for about 7 – 10 minutes until the eggplant gets soft. Add the green beans and bok choy to the pan and continue to saute, stirring often, for another 3 -4 minutes until all the veggies are cooked through but not mushy. Add the peppers and all the sauce ingredients and cook for a few more minutes to incorporate all the flavors together. Turn off the heat and let sit for a minute.